Expertise. Safety. Reliability. Move with the best! 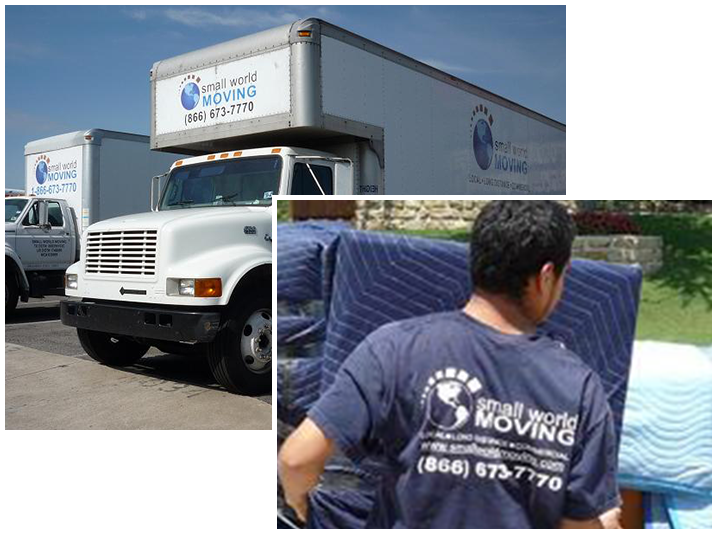 Small World Moving provides affordable local moving services anywhere in the DFW metroplex. We move apartments, houses, offices - no job is too big or too small. Small World Moving has frequent routes from Dallas to Austin, Houston, and San Antonio. If you are moving to any of these areas give us a call for a quote. When it comes to long distance moving, attention to detail is key to a successful move. Let our relocation consultants walk you through the process for easy relocation. Small World Moving has successfully relocated many companies within the DFW metroplex. We understand that commercial moving is a specialized field. Whether relocating or renovating your home, Small World Moving will keep your belongings safe and secure. Short and long term options are available. Need help packing your electronics, kitchen or entire home? What you may accomplish over extended weeks, our movers can accomplish in one day! Small World Moving provides white glove delivery service for many furniture retailers and designers. We customize our delivery service to meet your needs. The experts at Small World Moving offer green crates rental service as the perfect combination of an eco-friendly and cost-effective way to pack your belongings. Let us prove to you how our unrivaled combination of experienced professionals, affordable service and strong commitment to customer satisfaction can turn one of life’s most stressful events into a smooth transition. These guys were great and I really enjoyed working with all of them. You have a class act and I would recommend you to friends for future moves. Thanks for all of your help. Again, you Jerry and his team were great to work with and I appreciate your quality of service.